For the past 25 years, Dez Fafara has earned a living by making heads bang. 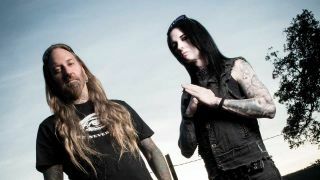 But when the Devildriver (and former Coal Chamber) frontman announced plans to make an album of outlaw country covers, many heads were scratched. Luckily for Devildriver fans, the band’s eighth album, Outlaws ’Til The End, Vol. 1 is arguably their heaviest outing yet, with a vibe that’s closer to black metal than Man In Black. Dez recorded with a number of friends in low places, including Randy Blythe, John Carter Cash, Hank 3… and fellow outlaw country aficionado Wednesday 13. Like Dez, Wednesday has his own outlaw country side-hustle, Bourbon Crow. We joined the pair at the Devildriver man’s Southern California home studio to chew the fat about the unlikely links between these two shitkicking genres. Let’s start with the obvious question: why make an album of outlaw country covers? Are you worried about any potential blowback from it? What are your earliest memories of outlaw country? That’s the George Jones song you share vocal duties on. How did the collaboration come about? Why did you bring in so many guest vocalists for the album? Do you think this album will turn metalheads into country fans? What do you think metal fans can learn from outlaw country? Do you plan to bring this album to the stage? Wednesday, how much crossover is there between your ‘regular’ fanbase and fans of your own outlaw country project Bourbon Crow? Johnny Cash covered songs by Nine Inch Nails and Soundgarden. Why don’t more country artists cover metal? Which metal song really deserves a country cover?